We welcome you to our home away from home!!! We are located at 620 west beach Blvd .We own another unit in this complex if you would like to see our style!!! 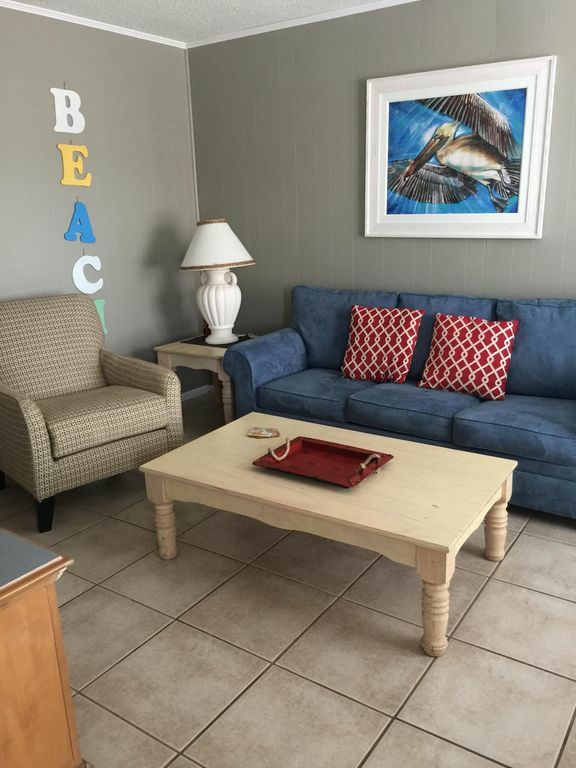 Freshely remodeled unit steps to the sand! We love the beach and want to offer a fun pet friendly getaway for your family!! Our unit features one bedroom with two queen beds , one bathroom ,fully stocked kitchen with starter paper towels and toilet paper , flat screens in the den and a porch that you can sit out on and enjoy the beach lifestyle with new patio furniture !We also own three other units on West Beach... 402975, 412640 and 426435, which this one is in this complex also. We are beach lovers!!! We live in a Florence Ms but have family in Fairhope AL and Pensacola FL, right up the road. My hubby and I started planning for our beach future early in our marriage and are working toward that dream!! This property is located in an area close to shopping and restaurants with beach access and includes the comforts of home!! We are adding new colors and decor to this unit right now and everything will be new and fresh!! Our condo is cottage style so it doesn't have anyone above or below you! Check in is 3pm and check out is 10am..
What a great stay. We arrived and the condo was clean and ready to stay in. The condo was spacious and great for our family of 4 + pups. The beach is right across the street. The walls are a little thin so we could hear people at the pool area but turned on a little white noise and it wasn’t an issue. I was pleased to see beach chairs and umbrellas in the closest. We didn’t end up using them since we had our own but I thought it was so thoughtful. We would absolutely stay here again. I was so thankful to find a great PET FRIENDLY place so close to the beach. We will be back. I had so much fun. The place is very comfortable. I'd go back for sure. We absolutely loved staying at this condo! It was the perfect size for what we needed and it was decorated so cute. It is in the perfect location too. We walked to many restaurants and the beach is just across the street. The best part is being able to bring our dogs with us. There was a dog walk in the back of the property. We enjoyed soaking in the hot tub every night. The kitchen had everything we needed to cook a few meals. Thank you so much for sharing your little bit of paradise with us! We are located in the middle of Gulf Shores and withing walking distance of restuarants, shops, activities, etc.. The Hangout is just a few blocks from our condo. We are located on West Beach, west of Highway 59 on a two lane road, Beach Blvd. Just steps across the street at a light to the beach!! There are restrooms and a bathhouse on the beach. You will find everything you need within a mile of our condo, including grocery stores, shops, resturants, Goofy golf, waterparks etc. Check in is 3pm and check out is 10 am..